What do you get when you put hundreds of knitting tips from people all over the country together in one place? The answer and my new favorite knitting book- Knitting Tips and Trade Secrets, Expanded: Ingenious Techniques and Solutions for Hand and Machine Knitting and Crochet. I picked this book up at a used bookstore last night and I read it cover to cover. 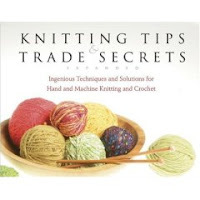 I love sitting at snb and learning little tricks from my fellow knitters and this book bottled that knowledge and much more in a handy reference guide. I bought the book after reading the section on doing seamless intarsia (argyle socks here I come,) but found it contained tons of other techniques I can use like knitting backwards, illustrations for picking up stitches, and how to reinforce the shoulders of a sweater to prevent stretching (very important when knitting with plant fibers.) This book also functions as a basic reference guide with directions for increasing, decreasing, seaming, grafting and several other techniques so if you are in the market for a reference guide I recommend this one since you get so much more than just the basics.